Patrick catches the eye of a wealthy passenger, Harry Elkins Widener, and eventually becomes the man’s private steward, not realizing that this new job will lead him down an intriguing and dangerous path. Harry is in possession of a rare and valuable book, and there are a couple of nefarious types on board who will do anything to steal such a prize. As the Titanic makes its way to its eventual demise, Patrick is trying to keep himself, his brother, Harry, and his precious book safe. In the process, Patrick discovers his own strengths and what really matters to him. Will Patrick be able to save Harry’s book from those bent on stealing it? And will he be able to save himself from the tragedy that is to come? 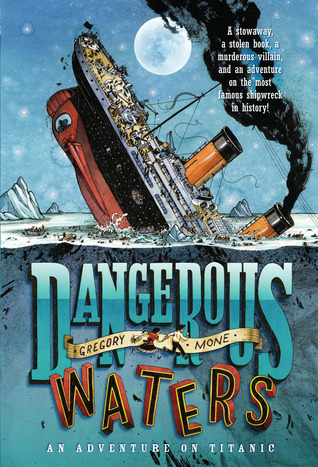 Join Patrick on his adventure aboard the Titanic when you read Dangerous Waters by Gregory Mone! George, better known as Suds, is glad that he’s not a baby or a cat anymore. He’s looking forward to being a “third grade angel,” especially when he begins to understand just what that means. His new third grade teacher, Mrs. Simms, will award a halo each week to the boy or girl who demonstrates the most “angelic” qualities. Well, Suds really wants the first halo, but is he willing to do what it takes to earn the prize? Suds, along with the rest of Mrs. Simms’ class, is soon behaving better than ever before. They’re picking up trash, holding doors for each other, and even fighting to help a lady who has lost her hat. To be honest, all this angel stuff is getting out of hand! Suds doesn’t know how much longer he can keep it up. And when his mom says that he needs to be angelic at home too–which means being nice to his little sister–Suds gets even more anxious about winning the first halo. 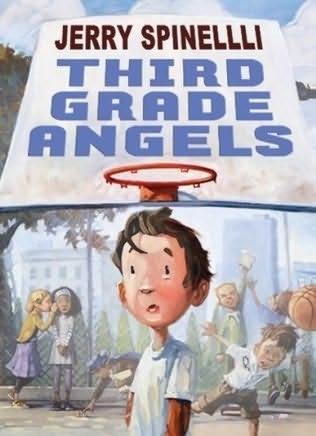 Eventually, when his other classmates forget about being angels all the time, Suds starts to like his chances of being the first “third grade angel.” But he’s not the only one who’s still in it to win it. How can Suds prove that he deserves a halo? What does a guy have to do to show his teacher that he’s the nicest kid around? And will Suds learn that being a real “angel” means doing nice things without being rewarded? Third Grade Angels is a pretty fun, quick read that is well-suited to read-alouds, particularly with third grade students. They will root for Suds to get the first halo, but I hope they question Suds’ motives. Is he being nice just to win a prize, or is he doing it because it’s the right thing to do? Many young readers may not grasp how fitting the ending of this book was, but that ending–and any confusion that surrounds it–could open up some interesting discussions about how people should behave, even when no one is looking. If you’d like more information on Third Grade Angels and author Jerry Spinelli, check out his website! 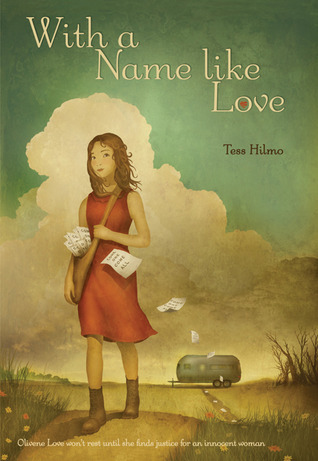 With a Name Like Love by Tess Hilmo is a nominee for the 2013-14 South Carolina Children’s Book Award. It is quietly beautiful, and it presents faith–and Christian love–as I think it is truly meant to be: selfless and without judgement. Ollie is the eldest daughter of the traveling preacher Everlasting Love. (Yes, that’s his real name.) In the summer of 1957, the family–which consists of Everlasting Love and his wife Susanna, Ollie, and four other daughters–travels to the small town of Binder, Arkansas, to set up their revival tent for three days. On her first day in Binder, Ollie meets a boy who will change her life. Jimmy Koppel has seemingly lost everything. His mother is in jail for killing his father, and, if something doesn’t happen soon, he’ll be shipped off to live with an aunt he’s never met. Everyone in the town appears to hate Jimmy just because of who his daddy was, and no one will believe him when he says his mom is innocent. No one except Ollie, that is. Ollie is determined to prove that Jimmy’s mom didn’t commit this horrible crime, but can she convince her father to stay in town longer than three days? She needs time to get information from Jimmy and prove his mom’s innocence, and time is something that’s quickly running out. And even if she does have time to do a little investigating, will folks’ attitudes about Jimmy’s family prevent them from coming forward with information…even if it could set an innocent woman free? As Ollie and Jimmy become friends, they are confronted with both the best and worst in humanity. Some people just can’t let go of their own anger and hatred, but some show these two young people–and everyone else in this troubled community–that there are good people in the world, and those people will do whatever they can to help those they love or people in need. Will the good outweigh the bad in this small town? Will the truth about the death of Jimmy’s father come to light? And what will Ollie learn about herself, her family, and friendship through all of this? Learn what love really means when you read With a Name Like Love by Tess Hilmo. With a Name Like Love would be a great addition to any elementary or middle school library. Regardless of a reader’s faith–or lack thereof–the message in this book is one that all could stand to receive. It will also find a place in many church libraries. This book is a work of historical fiction, but young readers, especially those who’ve grown up in the South (or have older relatives who have) will have very little problem relating to some of the things in this book. Some, though, may find it odd or even fascinating that people used to live without things like refrigerators or flushing toilets. If readers have grown up in a church (as have most of my students), they’ll even recognize some of the hymns sung by the church-goers in this book. To learn more about this author and this lovely book, visit http://tesshilmo.com/. Donovan Curtis’ middle name should be “Trouble.” He can’t seem to stop himself whenever the opportunity for mischief arises. Usually, he can get out of the messes he makes…but this time is a little different. All he did was hit a statue with a stick. How was he to know that the statue actually had two parts…and one of them was loose? Could he have possibly predicted that a large metal globe would careen down the hill at school and crash into the Hardcastle Middle School gymnasium during a big basketball game? Probably not…but all of it is his fault, and he knows that a severe punishment is coming. …or is it? Donovan knows that it’s just a matter of time before the superintendent calls him to the office for the punishment of a lifetime. Finally, the call comes…but it’s not exactly for what Donovan was expecting. It seems that there was a little mix-up, and Donovan is being transferred to the Academy of Scholastic Distinction (ASD). No detention. No community service. No paying for the damaged gym. No, thanks to a paperwork snafu, Donovan is being moved to a school for gifted students. Nevermind that he’s not what any teacher (or parent, sibling, friend) would call “gifted.” While everyone is a little perplexed by this news, Donovan sees it as his chance to escape from the trouble he’s caused at Hardcastle Middle. After all, if he’s not there, it’ll be a lot harder for the superintendent to find him! On Donovan’s first day at ASD, it becomes pretty clear that he doesn’t belong there. He doesn’t excel in any subject, and he spends more time in the bathroom than anywhere else. Both his teachers and his fellow students question why Donovan was placed at ASD. Soon, though, Donovan makes a place for himself at this prestigious school (that has much cooler, expensive, and newer stuff than the “normal” school down the road). Maybe what the high-IQ crowd needs most is a little dose of normal! Donovan brings new life to his ASD homeroom. He convinces the class to give their robot a name. He shows them that playing lots of video games might give someone some mad skills in operating said robot. He gets his very pregnant sister to provide the class with a much needed human growth and development credit. He introduces one genius to YouTube (which may or may not have been a mistake). It’s also thanks to Donovan that his new friends get to experience their first school dance. (It doesn’t end well.) Even though Donovan knows he’s not really one of them, he feels more at home with his genius friends than he ever did with his trouble-making buddies at Hardcastle. This book is a great read for anyone who’s ever struggled to fit in. 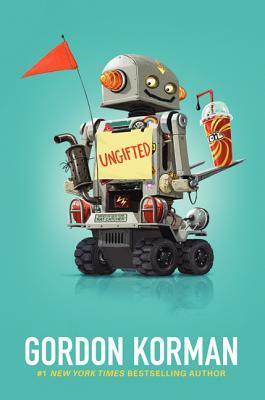 The story is told from multiple perspectives–kid and adult, student and teacher, nerd and normal–so every reader should find something to relate to in Ungifted. I think this book highlights that everyone has gifts. Some are just more obvious than others.